Since the dawn of the renaissance scientific inquiry has been guided by a mechanistic view of the world. Accordingly, the understanding of scientific theories, natural environments and human interactions under this paradigm has always aimed to simplify complex ideas as a means to facilitate greater understanding and innovation. Although this paradigm has undoubtedly served humanity well, there is an increasing realisation that a mechanistic view of the world does not provide a complete understanding of phenomena that are subject to dynamic change. This is especially true of human-environmental systems such as disaster resilience that are constantly altered through their mutual interaction between humans and their specific disaster risk contexts. 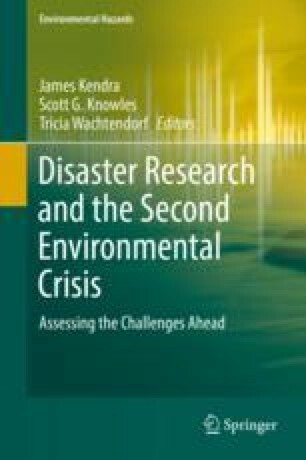 This chapter argues that in spite of this reality, the mechanistic paradigm, and the linear reasoning associated with it, still dominates the theories and policies aimed at understanding and building disaster resilience and reducing disaster risks. It is argued that the presence of this type of reasoning places a lesser importance on understanding contextually specific variables and their effect on resilience profiles as well as the dynamic interaction that subsume disaster resilience. This often leads to very shallow and oversimplified understandings of disaster resilience. Ahmed, E., Elgazzar, A. S., & Hegazi, A. S. (2005). An overview of complex adaptive systems. http://www.arxiv.org/pdf/nlin/0506059. Accessed 12 Mar 2015. Oxley, M. (2015). Review of the Sendai framework for disaster risk reduction 2015–2030. Global Network for Disaster Risk Reduction (GNDR). http://www.gndr.org/news/item/1490-critique-to-sfdrr.html. Date of Access: 21 Aug 2015. Wisner, B. (2015). Lies, damned lies and statistics. Global network for disaster reduction (GNDR). http://www.gndr.org/news/events/wcdrr2015/item/1370-lies-damned-lies-andstatistics.html. Accessed 21 Aug 2015.